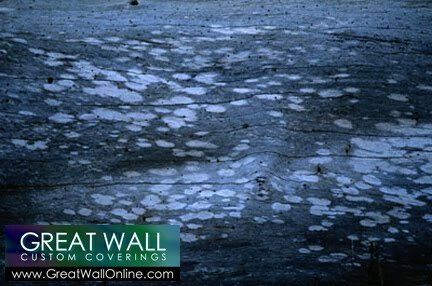 Custom wallpaper can feature just about any image, design, or texture. A look we love to experiment with is wood textures; the natural patterns created by swirling bark and liner designs of wood grain are both graphic and organic, an incredible combination. 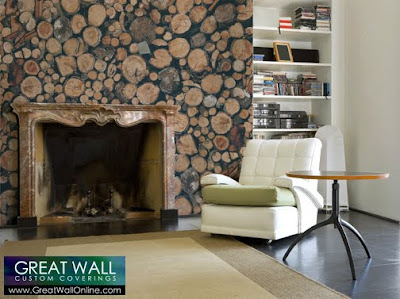 The rugged natural look of wood is even more compelling when juxtaposed with clean lined modern furnishings. As in the inspiration room above, the rustic wood wall mural stands out yet still manages to blend in with the contemporary room setting. Another stacked wood wall mural, with a graphic overlay that has been ghosted over the wood image. This mural is available for purchase in our Exclusive Designs category of wall murals. 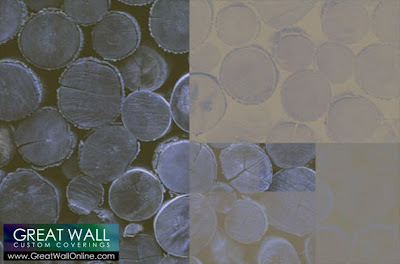 A more simplified wooden texture wall mural, available from our Natural Patterns line of murals. As always, if you have your own image of a compelling wood texture, we can produce that as your very own custom wall mural.